The Fusco name has been synonymous with cakes and desserts for over 50 years. In 2005 Fusco Foods purchased Connell’s Irish Family Bakeries, thus creating Fusco Connell Foods, an organisation with two major constituent parts, a food service business and a supermarket multiple / retail food manufacturer, located in Stillorgan Industrial Park, from where all manufacture takes place. Fusco Foods produces a wide range of food service and retail products. Some of the most popular lines supplied throughout Ireland and parts of the UK, would be our Death by Chocolate (using rich dark chocolate), Apple Pies (using Armagh Bramley Apples), Cheesecakes (using full fat cream cheese) and especially our multi award winning Meringue Roulades in various flavours from Irish Cream Liqueur to Sicilian lemon. 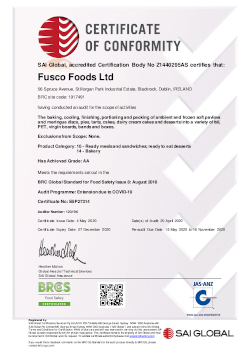 Fusco Foods has BRC certification for the production of bakery and ready to eat desserts (with no exclusions), involving both dairy cream and non-cream products (download BRC cert here). Fusco Foods has submitted its Origin Green stratgey to Bord Bia (Irish Food Board) (http://www.origingreen.ie/companies/plan-submitted/), and is thus in the process of reducing our impact on the environment as well as working to produce its products in the most efficient manner rosources will permit.